The trustees are delighted to announce the awarding of another scholarship. Our deserving recipient is Elodie Chousmer-Howelles, a 19 year old violinist from Chelmsford. In 2016, Elodie was announced as the new leader of the National Youth Orchestra of Great Britain for 2017. She attends the Royal Academy of Music and is a London Philharmonic Orchestra artist. 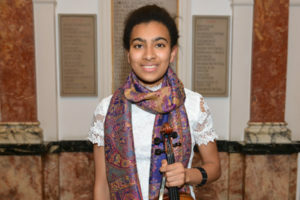 Earlier this year she performed in the BBC Young Musician 2018 Strings final. In order to find out more about Elodie, DRF’s Neil Foster had all the questions……..
Neil: How old were you when you first picked up a violin? Neil: When did you first realise you were actually good? Elodie: I don’t think that I actually ever really realised, but since I started lessons, parents and teachers would always make positive comments about my playing. Neil: How long do you practice for each week? Elodie: It varies but on average 21 hours per week. Neil: Do you play any other instrument? Elodie: No, although I have had piano lessons in the past. Neil: Why was the violin your instrument of choice? Elodie: It’s hard to say exactly but at 2 years old, I would watch my older sister (a cellist) at Brentwood Junior Strings Orchestra rehearsals, and find myself being drawn to the violins. By the time I was 5, I had seen the enormously talented violinists Jennifer Pike and Nicola Benedetti win the BBC Young Musician. From that point, I absolutely knew that it was the violin I wanted lessons on. Neil: Who are your musical heroes? Elodie: Nicola Benedetti and my singer-songwriter older sister Satin. Neil: Can you name a couple of recordings you think everyone should own? Elodie: Jacqueline du Pre’s Elgar cello concerto and Nicola Benedetti’s Mendelssohn violin concerto. Neil: What is your favourite piece of music? Elodie: That’s a really tough one but I’d say Brahms’ Violin Concerto. Neil: What is the piece of music you most wish had been written for the violin? Elodie: The Swan from Saint-Saens’ Carnival of the Animals. Neil: Who would you most like to duet with? Neil: Which venue would you most like to perform in? Elodie: The Royal Concert Gebouw Hall in Amsterdam. Neil: Who has been the biggest influence on your career to date? Elodie: My musical hero, Nicky Benedetti has definitely been my biggest musical influence. Neil: What has been your proudest moment to date? Elodie: Performing in the BBC Young Musician Strings Final earlier this year. Neil: What do you do to relax? Elodie: Luxuriate in a ‘Lush’ bubble bath surrounded by scented candles with Zen music in the background….Heaven!! Neil: What is your ultimate ambition? Elodie: My ambition has always been to have a successful professional career as a soloist and chamber musician. Neil: Tell us an interesting fact about yourself? Elodie: I have Barbadian and Guyanese heritage on my mum’s side of the family. Neil: Where in the world would you most like to visit? Neil: If you won the lottery tomorrow, what would your first expenditure be? Elodie: Definitely the purchase of a new violin. Neil: What one piece of advice would you give to an aspiring musician? Elodie: The best advice I can give is to stay determined and keep up regular practice. Neil: And finally Elodie, what does being awarded a scholarship by the David Randall Foundation mean to you? Elodie: The scholarship has taken away the burden of travel expenses to London (where my course is). I am required to travel to London up to five times a week often at peak times which is so costly and I am therefore so grateful to the DRF.